Skywatcher Colin Chatfield took this photo of the partial lunar eclipse of June 4, 2012, in Saskatoon, SK, Canada. He writes: "The eclipse here was fairly clear, with the Moon sinking into the clouds after about 45 mins of the start of the eclipse." The moon toe-dipped through Earth's shadow early Monday (June 4) in a partial lunar eclipse that appeared to take a bite out of our planet's nearest neighbor. The partial lunar eclipse of the full moon occurred in the wee hours of Monday morning in North America, with die-hard skywatchers rising early to catch a glimpse of the darkened moon. "Good morning, beautiful eclipse!" skywatcher Maggie Cates of Weatherford, Texas, told SPACE.com (and the moon) in an email. In Australia and Asia the eclipse actually occurred Monday evening due to the International Date Line. Skywatchers along the U.S. East Coast missed the event completely because the moon had set before the eclipse began. 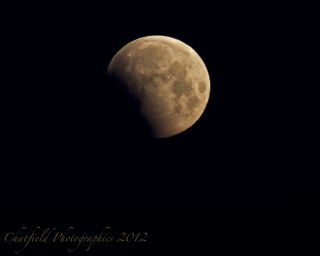 Skywatcher Tyler Leavitt took this shot of the partial lunar eclipse in Las Vegas, NV, on June 4, 2012. Photographer Tyler Leavitt of Henderson, Nev., took the opportunity to capture the predawn lunar eclipse with some other dazzling night lights: the Las Vegas Strip. His photo shows the partially darkened moon behind a brightly lit sign that bids farewell to Las Vegas visitors on one side and welcomes newcomers on the other. Lunar eclipses are caused when the moon passes behind Earth, with respect to the sun. When the moon passes directly behind Earth it creates a total lunar eclipse. Partial lunar eclipses happen when only part of the moon passes through Earth's shadow, an effect that occurs because the moon's orbital tilt is slightly different than the plane of Earth's orbit around the sun. Monday's partial lunar eclipse stands out this year because of its timing. The eclipse occurred just over two weeks after a dazzling "ring of fire" solar eclipse on May 20, and came just one day ahead of what is possibly the most anticipated skywatching event of the year: the historic transit of Venus across the sun on Tuesday, June 5. On Tuesday, Venus will cross the sun when viewed from Earth in a rare planetary alignment. The celestial sight occurs in pairs, separated by eight years, only once every century or so. The last transit occurred in 2004 and the next one won't occur until 2117. NASA scientists and astronomers around the world have prepared extensive observation campaigns and public outreach programs to observe the transit of Venus. "Backyard astronomy doesn't get much better than this," astronomer Tony Phillips wrote in a NASA skywatching alert. Editor's note: If you snap a great photo of the partial lunar eclipse OR the Venus transit on June 5 and would like to share it with SPACE.com for a story or gallery, please send images and comments to SPACE.com managing editor Tariq Malik at tmalik@space.com.